Boy is the sun shining. Every day. Sun, sun, sun. Nothing but sun. All the sun the grass can eat. It’s time to put that grass away for later. 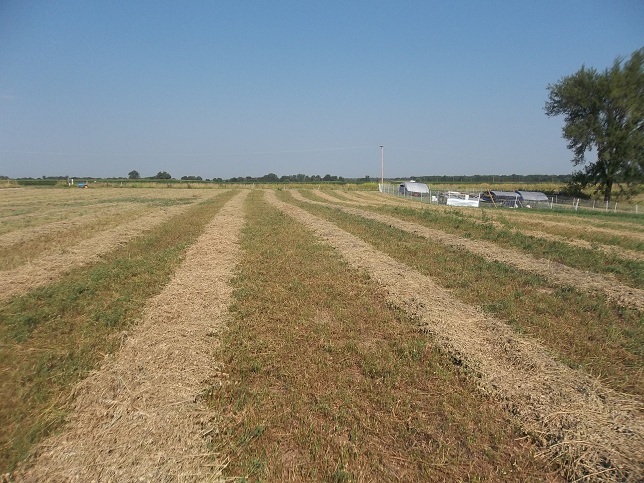 Let’s focus on the alfalfa field for now. 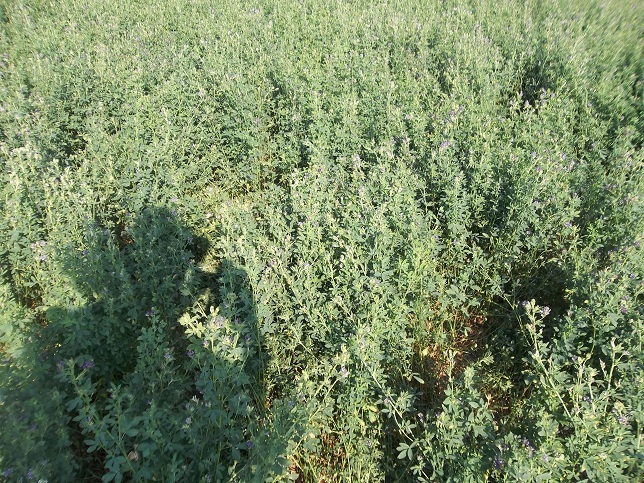 The alfalfa field looked like this (well, not as many blooms). You want to allow the plants to get to about 10% bloom before you cut. So we cut it three days ago with dad’s hay conditioner. It gobbles up the hay, crimps the stems and lays it gently in a windrow out back. but if we look closer we see it needs to be raked before we bale. The stuff underneath isn’t quite ready yet. Next I rake the windrows together, turning the hay so it will dry better, combining rows so we make fewer passes up and down the field baling. What’s a rake? This is a rake. A few hours later and we’re ready to bale. We baled and baled and baled. The bales may get moldy from all the sweat I soaked them with. 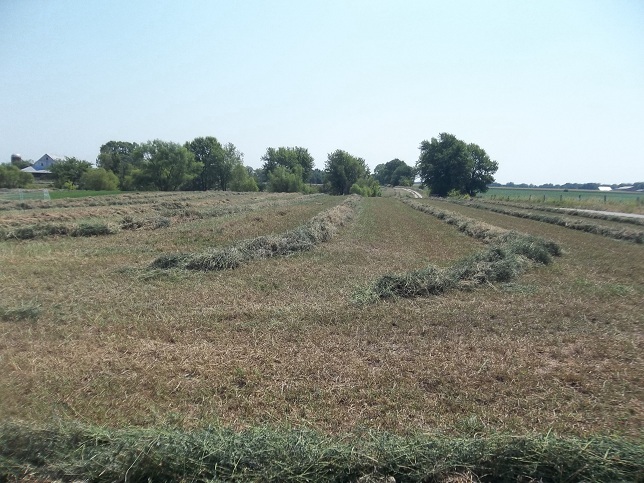 No pictures of the baling process this time but you can look at the blog post from an earlier hay cutting. Now it can rain. Please, Lord, let it rain. I’ll take a light rain that lasts 3 weeks. I’ll take a series of downpours over the next three days. Last night it sprinkled just enough that you could smell the rain on the hot tar of the road. That’s a summer-only smell…and I would like to smell more of it. Just let it happen, Lord. I’m ready. 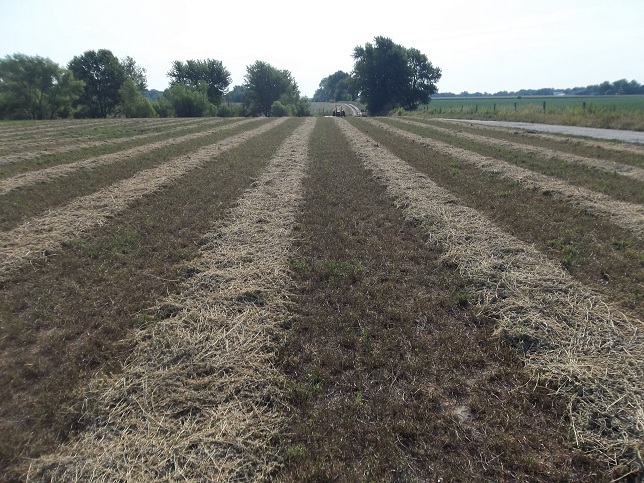 This entry was posted in Farm Equipment, Pasture Management, Seasonality and tagged Alfalfa Hay. Bookmark the permalink. ← Whoops! What is THAT?!?!? Our preacher is Nigerian, and deplores our restraint in church – the proper way to say Amen is to throw your heart and voice into it. He’s got uphill work with us Canadians. That Amen I just said after your prayer for rain? It’s from the heart, and shouted loud and clear. Nice post. 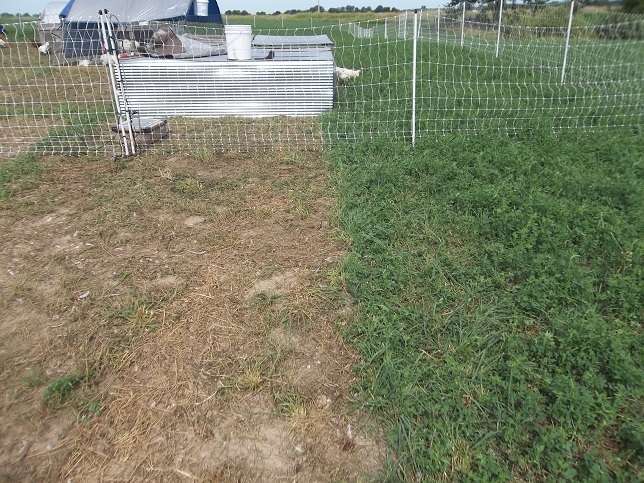 I have zilch experience with alfalfa, but I see the haying issues are much like with grass. For picking up those bits missed by the baler, we grab a big tarp and drag it around the field, scooping hay on with the fork. I figure we can get a couple of bales worth in one trip that way.As long as small kids don’t try to ride the tarp. We do that with leaves in the fall. Don’t know why I never thought of it for hay. 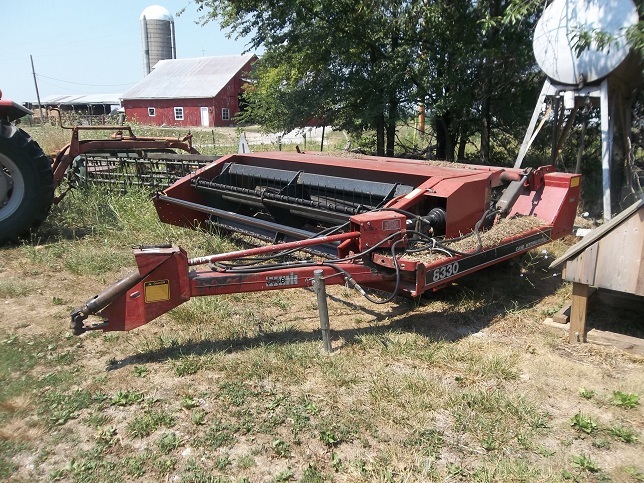 In addition to knowing zilch about alfalfa, I had also never seen a rake like the one you pictured – here, the rakes are ALL the kind with rotating wheels of spokes, sometimes huge gangs of them on one tractor. Yours is a rolabar type perhaps? On the web, New Holland seems to have something similar. 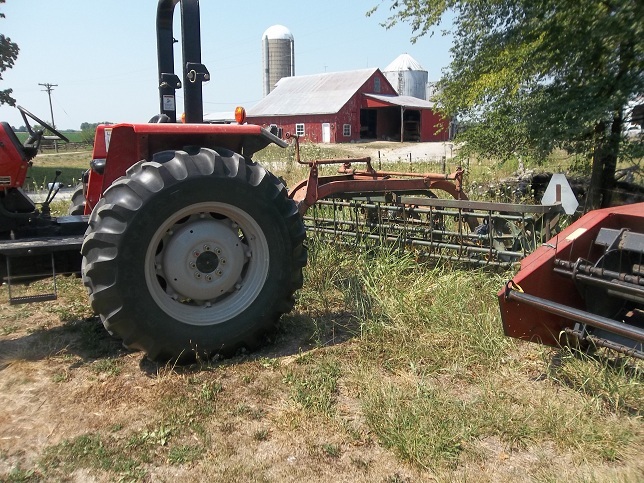 imho, most of the better tractors and equipment are older not newer. Nothing wrong with old if it works and is paid for, for sure. Awesome post. I knew enough to know there was an awful lot I didn’t know about making hay, and this makes it a bit less mysterious. Most years it is my job to drive the tractor, then both men work behind the baler. HFS really down played just how hard they have to work. With the 100 degree days we have been having, the work is really terrible. Want to guess the temperature up in the barn loft? Just saying. Figured it had been a hot miserable job in your heat, but hadn’t even considered the loft – must have been a sauna. We try to unload wagons early in the morning when it’s cool. I think we have four full wagons currently. Haven’t unloaded them yet. 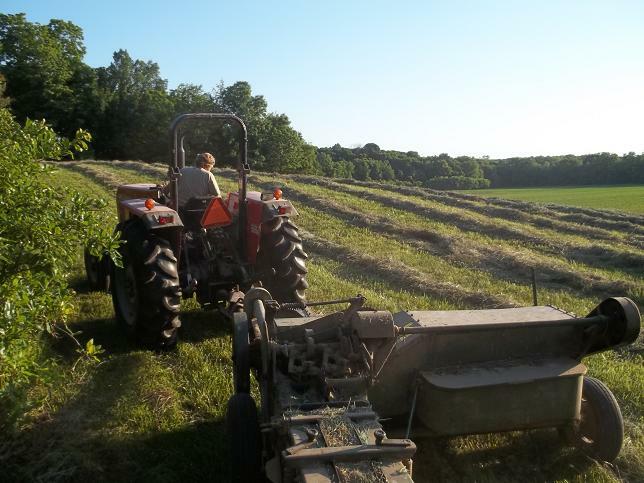 Hope you don’t run out of wagons…Ben Hewitt just did a great post on unloading hay with his boy…tis the season. A battery of Q’s! How old is this stand of alfalfa? Is there any grass mix in it? 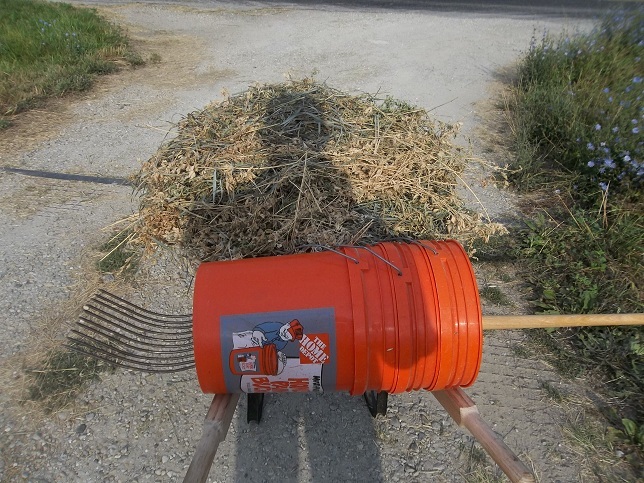 How many lbs or tons of hay do you get with each cut? How many acres is it? How much or many acres of the field do the chickens work in a yr? Do you run cows thru any of it in the fall or winter? What increase in production have you seen with this added fertilizer? It’s kind of fun reading your comments as you read through. I have no idea what I have written about in the past and am surprised (embarrassed) how often I revisit the same topics…or just rewrite the same posting. You get a star from me. It is a great read with all your “how we” experiences and is really quite a story as it unfolds with your different ventures on the farm. I have 3 or 4 posts so far that I have noted for myself that if I don’t find the answer in your future posts I will ask but so far don’t want the spoiler just yet on some of them! Take for example your goats, you blog about them in 2012 where I am right now, and I know you don’t have them anymore so I just need to keep reading to find out what happened. At the end I might end up with a hundred what ever happened to this or that or I thought you were goiing to try ______ or did you ever? and could become a higher maintanance reader that I already am – LOL ! lol. You are not high-maintenance. Just inquisitive…and that’s good. We upgraded our goats to something larger and easier to feed and fence. We sold Olive’s offspring to the woman we bought Olive from. We sold Olive to a nice lady who wanted a sound goat. What we didn’t sell got eaten. End chapter 1. I think I have 17 acres of alfalfa that is 5 years old. One spring the chicken tractors were sitting on a particularly flat spot during a series of heavy rainstorms. 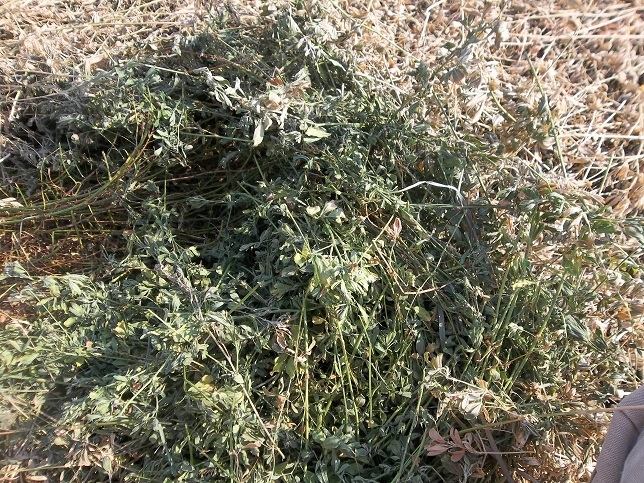 The alfalfa never really recovered there. We have had 2 years of heavy spring rains and sustained hot summer droughts. That’s been hard on all the plants. This is the first year we grazed it in the fall. I am trying to introduce grasses into the stand as I am against monoculture in any form. Besides, nature is invading. I am trying to shift it in my favor. The thing that field needs most is organic material. Do you have a plan for this season to accomplish this? A little at a time. 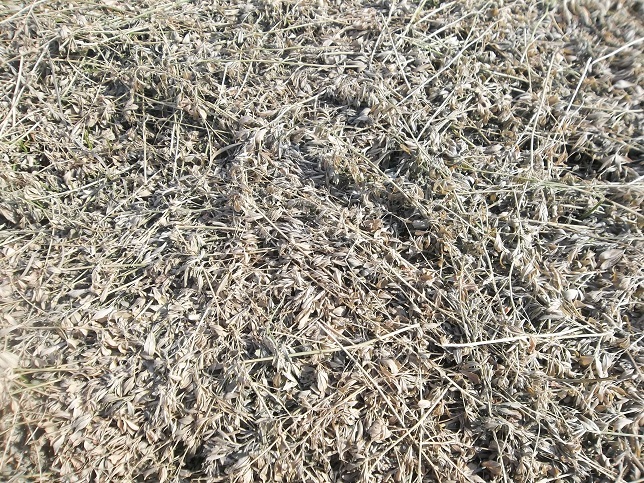 We talked about drilling rye in after the last hay cutting last fall. But mainly, a section at a time we are seeding into the stand with perferred grasses and beginning to graze it. We are also making it a point to graze the field edges before making hay. Cows drop seeds.